Vitamins and minerals are essential to a healthy, functional body, but many times we are unaware of the role each one plays. 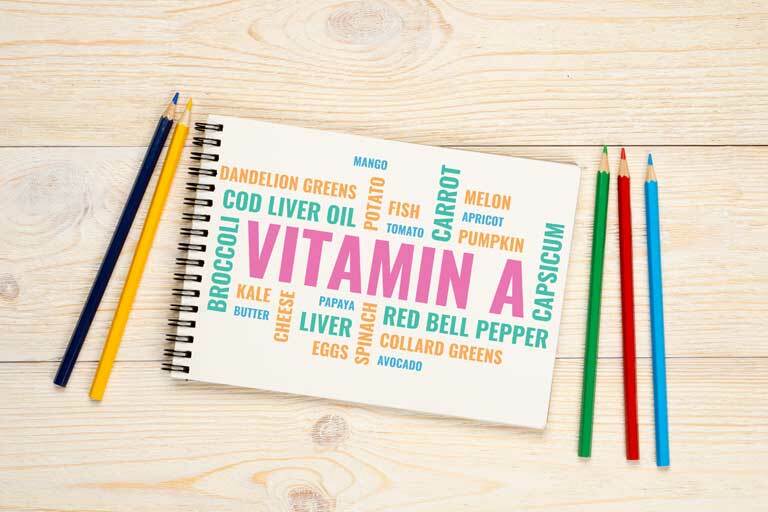 Join us as we explore these vitamins, starting with A.
Vitamin A is a fat-soluble compound that is stored in the liver. There are two types – preformed Vitamin A, which is found in animal products such as meats, dairy and eggs, and provitamin A, which is found in plant-based food sources. You may be familiar with the term retinol, which comes from preformed Vitamin A, and with the term beta-carotene, which comes from provitamin A.
Vitamin A plays a vital role in keeping your eyes healthy. It helps your retinas process light, and individuals with A deficiency tend to have difficulty with night vision in particular. This vitamin also helps keep your skin, immune system and cells healthy. As babies develop in their mothers’ wombs, Vitamin A helps with cell growth and the development of the internal organs. How do you get Vitamin A? Vitamin A is common in a variety of foods. Among animal products, it is highest in liver foods, beef, eggs, fortified milk and fish, especially herring and salmon. In fruits and vegetables, Vitamin A tends to be highest in produce that boasts the richest colors, whether that be leafy green veggies like spinach and kale, or red and orange veggies like carrots (remember beta-carotene? ), sweet potatoes, mangoes and apricots. Vitamin A supplements are also available, although as we will see, they are often not necessary except for specific medical needs and can even be toxic if you get too much. Can I get too little? Most Americans are not in danger of Vitamin A deficiency. That is because most Americans eat enough foods containing the vitamin, and it doesn’t take much to have a sufficient amount. In other countries, where fresh fruits and vegetables, as well as fresh meat and dairy, are hard to acquire, Vitamin A deficiency is more of an issue. Chances are, if you are reading this article, you are getting enough Vitamin A. Research has shown that there are no adverse health effects to having a lot of beta-carotene from plant sources. Excess beta-carotene may tint your skin yellow or orange, but you would have to eat a lot of it for those symptoms, and the skin coloration returns to normal when a person goes back to a normal intake. However, we need to exercise caution with the preformed Vitamin A found in animal products and supplements. Too much of this type of Vitamin A can have serious negative side effects, including liver damage, birth defects, blurry vision, nausea, headache, skin irritation, joint pain and bone thinning (which is especially bad for seniors). When it comes to Vitamin A, as with nutrition in general, simple balance is the way to go. Enjoy a variety of fresh fruits, vegetables, dairy and meats, and be moderate in all things. Then, as you take a bite into a carrot or a swig of milk, you can thank this vitamin for doing its job of keeping you healthy and thriving.